Rather than pleading FOR something in a prayer, I’ve switched things around and started thanking God/Spirit for what I already have and all that I’m am hoping for, as if it’s already happened. I prefer not to live in a state of wanting, rather BEING in this moment and expressing gratitude. My daily prayers are a collection of bits and pieces of what I’ve read or heard over a long period of time. I have typed them on my computer and printed them out so I can read them rather than trying to think of what I want to say. This way I can revise and update them at anytime. Some of the words are more geared for MORNING and others for NIGHT, with a big overlap. Many come from Sylvia Browne’s books; the one I have enjoyed most is Life on the Other Side—it’s given me a lot of peace of mind since my father’s passing. This week I’ll share with you some of my personal morning words of thanks; next week I’ll continue with that, and then later focus on night prayers. I invite you to visit my website at CWLauro.com to gather some wording that may help to lift you up and focus on what you truly want. Thank you for joining me on this spiritual journey. See you next time. P.S. 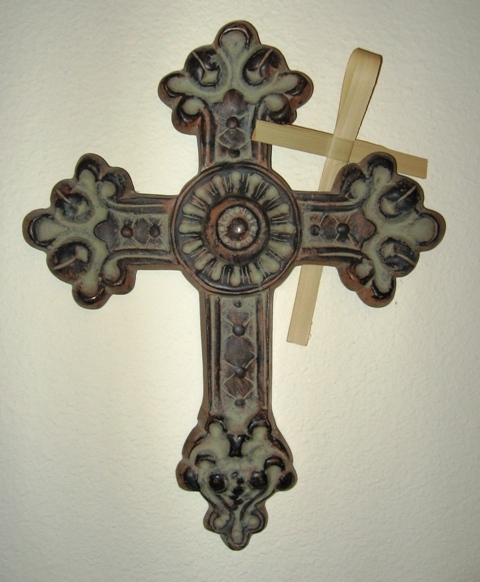 This cross above is one of the first things you see when you walk into my home. This entry was posted in Spiritual Journey and tagged Cathy W. Lauro, expressing gratitude, finding joy, God's grace, gratitude, how to be happy, inspiration, morning prayers, night prayers, prayers, prayers of thanks, The Inside Advantage. Bookmark the permalink.